Of all the different exterior siding choices available today, steel and vinyl siding stand out for the excellent value they offer. Both of these materials shed moisture rather than absorbing it. They won’t support mold or mildew; nor will they succumb to moisture damage. Steel and vinyl siding are designed to look good for many years, retaining their original color despite extreme exposure to the elements. And they deliver this impressive performance without requiring any maintenance. Your installation expense is your only expense. An old window stands out like a sore thumb when a house gets new siding. Older windows also waste energy, compromise interior comfort and require regular painting. For the ultimate exterior makeover, consider having our premium vinyl replacement windows installed along with your new siding. Low-e, argon-filled insulated glass and advanced vinyl construction mean you’ll get maximum energy savings and totally maintenance-free windows. Steel exterior siding is different from aluminum siding. The former is stronger and more impact-resistant than the latter. Installing steel siding on a new or existing house is probably as close as you’ll come to giving your home a Kevlar® vest. Fireproof and far more resistant to denting, bending and crimping than aluminum siding, steel siding has been in common use on houses since the 1950’s. Even before then, it proved its worth on farm and commercial buildings. Steel siding is a green product, formed from American-made steel rather than from petroleum products. Unlike vinyl siding, steel siding can easily be recycled. Today’s steel siding comes in a variety of popular colors and profiles. Horizontal and vertically oriented siding installations are possible. Thanks to a galvanizing treatment and a high-tech, multi-layer finishing process, today’s steel siding carries an unprecedented warranty against fading, corrosion and hail damage. Just like steel siding, vinyl siding offers the advantages of zero maintenance, immunity to mold and moisture damage and plenty of styles and colors to choose from. In better-quality vinyl siding, a woodgrain surface texture can make the product look surprisingly like real wood. Better grades of vinyl siding also tend to be thicker, for improved rigidity and greater impact resistance. If you’re planning to have steel or vinyl siding installed, it’s smart to ask about rigid foam insulation that can be installed beneath or integrally with the siding. 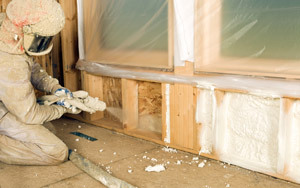 This added layer of insulation improves the R-value of your exterior walls, helping your house to retain heat during winter months, and keeping heat out during the cooling season. A layer of rigid foam insulation can be installed beneath the new siding, or you can buy your siding with the foam already attached to each siding course or panel. 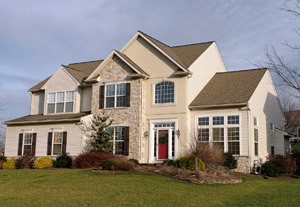 The overall impression created by new siding is as much about trim details as it is about the siding itself. In a truly professional installation, the corner trim, J-channels, soffit panels, gutters and downspouts all look good together. Compatibly colored caulks and sealants should also be used. Make sure to discuss these details along with your siding choices when planning your new siding installation. For a siding price estimate contact Restore of the Heartland today! We work in Topeka, Manhattan, Salina, Emporia, Mcpherson, Fort Riley, Abilene, Junction City and nearby.